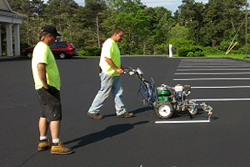 AFineLine Striping Services has quickly become the go-to parking lot maintenance company in the Greensboro, NC area, and for a good reason! At AFineLine, our technicians are dedicated to providing our customers with the industry’s best service, workmanship, and materials. We work hard to earn the business of our customers, and we are committed to their satisfaction. Our lot striping and repair experts can handle jobs for lots both large and small. Give us a call to discuss your needs with our experts and to learn more about what we can do for you. We’d be happy to answer any questions that you may have and to schedule an appointment with you.